The Clutch Caddy takes the danger out of clutch handling and makes it a safe one man job! 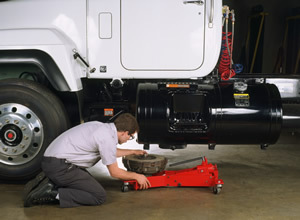 The Kiene Clutch Caddy allows one mechanic to remove and install heavy truck clutches – unassisted. The Clutch Caddy minimizes the danger of injuries – hernias, back, hands, feet by taking the lifting out of the mechanic’s hands. 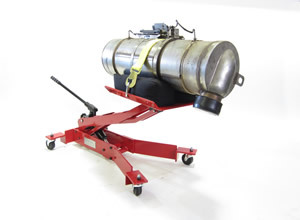 Clutches can be assembled or disassembled piece-by-piece to avoid lifting the complete hard-to-handle component. 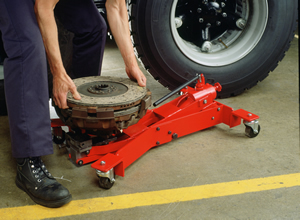 It’s the only tool with a profile low enough (13”) to allow the tool and the clutch to roll under the truck. 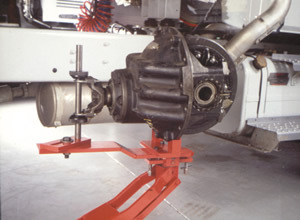 The clutch can be loaded onto the Clutch Caddy next to the truck, not under it. 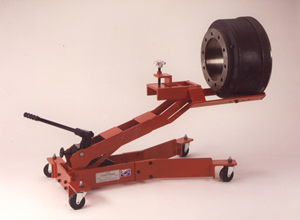 Clutch Caddy Adapters make the toughest shop jobs safe, easier and more cost effective. Click here for our full line of adapters.